Here are a few guidelines to help you choose an appropriate Reiki Master teacher or practitioner. 1. Are they are a member of a professional organisation? 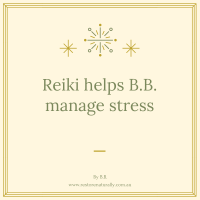 Restore Naturally Reiki Courses are recognised by the Australian Reiki Connection and the Australian Association of Massage Therapists. If you are a member of A.A.M.T. you will earn 20 CPE points for each Reiki Course you do. 2. Do they offer ongoing support after the course or a treatment? I offer post course and treatment support via telephone and email. 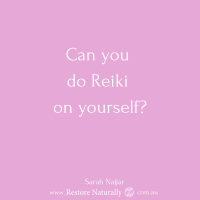 I enjoy hearing how you are benefiting from learning and receiving Reiki and how your self-Reiki practice is developing. Restore Naturally Reiki courses include a 21-day e-program. 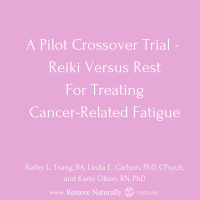 A simple exercise arrives in your inbox encouraging you to connect to Reiki for 21 days after each course. You are welcome to attend Reiki groups. They are a great opportunity for you to connect with like minded people and give and receive Reiki. 3. Does their manner suit you? Are they available to talk to before the course? I am able to talk to you before and after courses and treatments. I am approachable, down to earth, positive, friendly and empathetic. 4. Do they have adequate Reiki experience? I have been practicing Reiki since 2002. I have treated over one thousand people in professional practice and have taught Reiki to hundreds of students. I am passionate and dedicated to Reiki practice. I ensure that you have through Reiki training and excellent Reiki treatment sessions. 5. 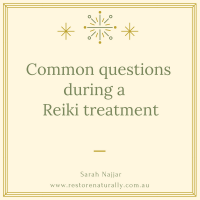 Do they practice Reiki on a daily basis and incorporate Reiki principles into their everyday life? I practice Reiki on a daily basis and strive to live by the Reiki principles. I love meeting other Reiki practitioners to discuss Reiki and expand my understanding of this gentle and effective spiritual healing system. 6. Does their course content meet your needs? Restore Naturally Reiki Courses are structured so you receive through Reiki training. You complete the course with a solid understanding of what Reiki is and how you can apply it in your everyday life. You receive a comprehensive manual and certificate to take home with you. Restore Naturally Reiki courses include both Western and Japanese Reiki techniques so you receive balanced training. 7. Trust your intuition. Your inner compass will guide you to the teacher that is right for you. “Sarah is friendly, polite and professional. A great teacher. 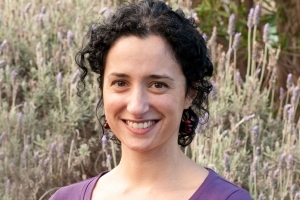 I would recommend Sarah to anyone who wants to learn Reiki. The Reiki Level One and Two courses are well structured and the teaching was great. I could not ask for anything more. All my questions we answered and my expectations were exceeded.” Sam A.